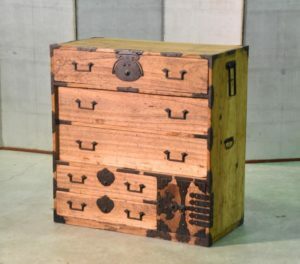 A very good example of a Kyoto Antique step chest. 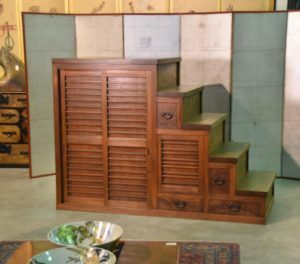 In comes in 2 sections and was made by a furniture maker then installed into the house to access the second floor. The last photo is of this chest before we cleaned it up and French polishedIn great condition. $50 delivery in Sydney CBD, $100 to outer Sydney, $180 Blue Mountains, $330 to Melbourne and Brisbane. $650 to Perth, Cairns and Darwin. $400 to Adelaide and Launceston. Please email for other areas or pick up from the warehouse. Interstate delivery is 2 to 4 weeks approximately. SKU: 13617. Categories: Chests, New Arrivals, Stair Chests.